I am very excited today to have Kelly Ortiz, whom we all know as the Disney Guru!! Today Kelly is going to be Mentoring us on being a Disney Travel Specialist. I know there are a lot of you who have considered trying this career path, and Kelly was kind enough to talk about her experience. She is really a Super Girl (there is a pic below to prove it)! Thanks so much Kelly, I am so thrilled to have you as a Monday Mentor!! Welcome Kelly! Everyone knows you as the Disney Guru, but today we’re talking about your job as a travel specialist. First, tell us all little about yourself for those meeting you for the first time. Donna thank you so very much for having me here today. Words cannot express how honored I am to be considered for a spot on your Mentoring Mondays. Thank you!! 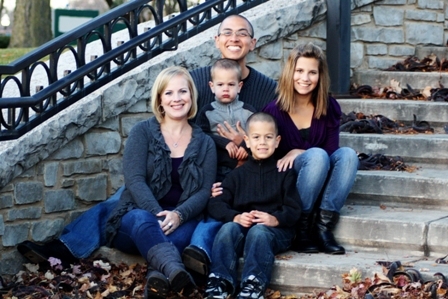 I live in the Chicago area with my wonderful husband Dan and my three beautiful children, Lexis 14, Logan 6 and Lucas 3. We also have a very active 1 ½ year old Doberman named Max. In addition to my extreme LOVE for Disney…I am also a dance mom. No…nothing like the new show “Dance Moms” but I spend my days traveling around to competitions and adding rhinestones to costumes. Before staying home with my children, I was a teacher and I LOVE everything about working with children. I feel so blessed to be able to have Disney in my life every day…what a positive way to start and end my day. What inspired you to become a travel specialist? When , I started blogging last year being a Travel Agent was just a dream that I thought would never come true. After seeing how much of a positive impact the entire Disney community has had on my life I decided to try and make it my career. Not only do I see travel planning as a career but Disney Guru is also my career. Our fans and followers mean the world to me. I am forever grateful that all of you have given me the opportunity to live out my dream. Describe the process and requirements for becoming a certified travel specialist? What start up costs are involved? For the agency that I am working with there are not any start up costs involved in becoming an agent. You just need to be willing to work. Are there any personality traits you feel would benefit someone who is thinking about becoming a travel specialist? I believe that blogging for almost a year before I began has helped tremendously. Outgoing and friendly personalities will thrive in this business for sure because clients want you to be their Disney friend. You also have to be willing to pay close attention to detail as every client is different. Last but not least, you have to be organized. I am sure there are a lot of people who think it would be so much fun to become a travel specialist, but it’s really a lot of work. Please describe what would be involved start to finish for a client. With so many different clients and Disney packages, how do you keep it all organized? Well, this part can be a challenge because when you are working from home you may think that you can just wing it in the office area. Well, needless to say I am on my way to get a desk and set up my office tomorrow. I have to have a space to spread out and call my own. As far as organization, I have a file cabinet that is dedicated to my clients. In the file cabinet I have three drawers each one is dedicated to a year, 2011, 2012, 2013. Within each cabinet is a file for each month and within each month are files labeled a-z. I file the clients by travel date so that I can monitor their reservations by month and deal. I am always trying to get the best deal possible for my clients. I know having a paper trail is a bit old fashioned so I do keep some info on my computer too but I like to be able to pull a file and review it. Last, I have an on the go file with client names and contact numbers. This is in my purse with all reservation numbers and Disney phone numbers…you never know when someone may need help when I am not at home. What is your #1 “must do” each and every Disney trip? I have to go on Space Mountain…the year it was closed for refurbishment I just did not feel as accomplished….haha. Number 2 is, we have to eat at Sci-Fi Dine In…we just have to. I am honored to be a part of the best blogging community in the world. It is my hope that through Disney you find fun, love and togetherness. Disney hugs to everyone!! Wishing you a magical day!!! Thanks again Kelly! if any of you readers have a question for Kelly you can send it to disneydonnakay@yahoo.com and Kelly will answer it here on Friday. Along with Kelly I hope all of you a have a Very Magical day!! Hi Kelly, What a great career- work AND fun!! Thanks for the tips- you never know when you'll need a caring and focused travel agent!! Another great interview Donna Kay! Kelly, thank you so much for sharing your journey to becoming a travel agent! Thanks D & Beth! Kelly was an absolute joy to work with & I love the info she has shared with us. I really enjoyed the interview and tips from Kelly, she is very sweet. Proud to say that Kelly is now MY travel agent!! Yay Kelly! And Yay Donna for having her as a guest! Aww....thank you so much to Diane and to Kathy. I love all of you ladies!! Thanks everyone for stopping by! Your support means the world to me. Thanks Kelly, it has been my pleasure to have you! !